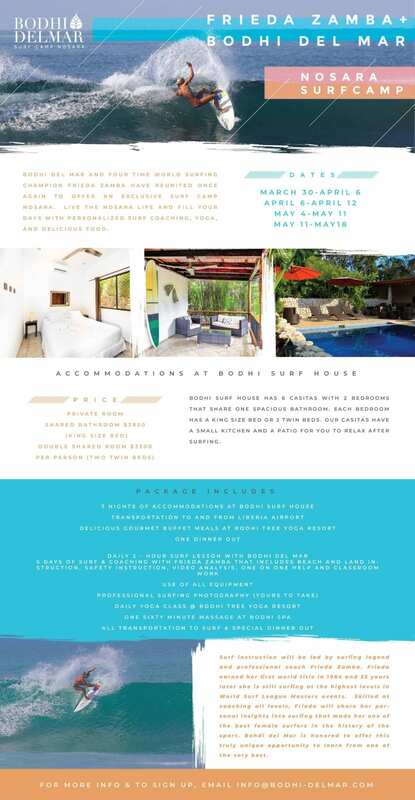 Bodhi del Mar and four time World Surfing Champion Frieda Zamba have reunited once again to offer an exclusive surf camp Nosara. Live the Nosara life and fill your days with personalized surf coaching, yoga, and delicious food. Surf instruction will be led by surfing legend and professional coach Frieda Zamba. Frieda earned her first world title in 1984 and 35 years later she is still surfing at the highest levels in World Surf League Masters events. Skilled at coaching all levels, Frieda will share her personal insights into surfing that made her one of the best female surfers in the history of the sport. Bohdi del Mar is honored to offer this truly unique opportunity to learn from one of the very best. Bodhi Surf House has 6 casitas with 2 bedrooms that share 1 bathroom. Each bedroom has a king size bed or 2 twin beds. Our casitas have a small kitchen and a patio for you to relax after surfing. Frieda Zamba is a four-time world surfing champion from the United States. She won three titles in a row from 1984 to 1986, then won again in 1988. She currently lives in Costa Rica. Frieda Zamba was the youngest female to win a pro tour contest and the youngest surfing world champion ever. She went on to win three titles in a row and then fought back to win a fourth. Outright dangerous in small to medium surf, Zamba crossed the performance chasm that separated male and female surfers in the 80’s and, based solely on performance, is regarded by many as the greatest female surfer ever. Besides being a talented and tactical competitor Zamba was incredibly popular during her reign. She won 5 straight Surfer Poll awards from 1985 to 1989 and was profiled in a 1987 piece in Sports Illustrated titled “Queen of the Surf.” In 1998 she was inducted into the Surfing Walk of Fame as that year’s Woman of the Year. In 2006 she was inducted in to The East Coast Hall of Fame. Frieda Zamba’s surfing blurred the edges between male and female wave riders, and while that may be a cliché used when describing great women surfers, at a time when surfing finally demanded a global audience, Frieda Zamba was the undisputed queen of professional surfing. 1998/99 Frieda Zamba owned and operated Zamba Surf Camps during the summer months in her hometown of Flagler Beach, Florida along with repping for numerous surf industry companies over a span of 12 years. 2009 while still active in the surf industry and with her summer surf camps becoming successful in Florida she started branching out to coaching some local pro/am surfers on the weekends and at surfing contests. 2012/13- present. She relocated to Costa Rica to start coaching full time and currently owns and operates “Zamba Global Surf”. She saw the need being an east coast surfer herself to be able to advance your skills in more challenging conditions and on a more consistent basis and Costa Rica was the perfect location.